Ryan Sutherland, shown here performing a traditional Indonesian dance, graduated last week with a double major in music and biology. But he leaves something important behind at Emory: an archive based on ethnomusicology research he conducted here and in Bali. Photo by Anandi Salinas. Sitting amid a sea of graduates on the Emory Quadrangle last week, it was hard for Ryan Sutherland not to reflect on the experiences he would be taking with him. But even as Sutherland prepared to leave Emory with a double major in music and biology, he knew that he would also be leaving something important behind. With the aid of grants through The Bradley Currey Seminar, which supports archival undergraduate research, and the William Lemonds Award for Summer Study Abroad, offered through Emory’s Music Department, Sutherland was able to follow his interest in the gamelan — a traditional Indonesian percussion ensemble — all the way to Baturiti, Bali, Indonesia, last summer. There, he had the opportunity to study Central Javanese and Balinese gamelan performance for more than a month with gamelan guru Pak I Made Lasmawan — an immersive experience that found him donning full face paint to join in a traditional Balinese dance performance and playing sacred instruments for a traditional Ngeratep Ratu Sakti odalan temple ceremony, complete with Brahmin priests and mantra singers. But returning from Bali, Sutherland felt he had something more to share. The Currey award had given him a chance to refine his research skills in seeking, compiling and interpreting ethnographic data from multiple primary sources. And within the original Indonesian gamelan recordings and intricate sheet music that he brought back with him, Sutherland saw the seedbed for a new archive. Working with University archivist John Bence, Sutherland received permission to add an archival component to his thesis, gathering documentation on the history of the Emory Gamelan Ensemble and ensemble members in addition to his materials from Bali. This summer, he will work with Bence to assemble the start of a new collection at Emory’s Stuart A. Rose Manuscript, Archives, and Rare Book Library that will include hundreds of karawitan (traditional repertoire) and will illuminate the history of gamelan performance at Emory, which hosts one of the few and most robust gamelan ensembles in the southeastern United States. The initial collection will be assembled this summer. And while it is a modest beginning, “once a collection has been started, then we can begin adding to it,” Bence says. For Sutherland, securing a permanent home for his recordings and research — as well as source material for the Emory Gamelan Ensemble — is both gratifying and exciting. “Some people question the relevance, the centrality of world music,” says Sutherland, who was a Dean’s Achievement Scholar in the Emory Scholars Program. Sutherland arrived at Emory intent on majoring in music performance — with an emphasis on the saxophone — and biology, subjects that remain his two great passions. But during his second semester he felt the urge to “get outside my comfort zone.” So he joined a Brazilian samba group, with a focus on music and percussion. Next, he began working with an Argentine tango ensemble led by his major adviser, senior music lecturer Kristin Wendland, “which was wonderful,” he says. “Ethnomusicology, the study of ethnic instruments, opened my mind to the world,” Sutherland explains. A chance to visit the gamelan room, part of Emory’s World Music Program, “felt like a homecoming.” Soon, he was performing in the University’s gamelan ensemble. Founded in 1997, the Emory Gamelan Ensemble held its first performance during a wayang kulit (shadow puppet play) at the Michael C. Carlos Museum. A year later, the group performed for His Holiness the XIV Dalai Lama and has continued to perform for visiting dignitaries and at special events at Emory and throughout the Atlanta area. In 1998, Emory acquired its current set of Central Javanese gamelan, Paksi Kencono. And in 2007, it was one of five institutions to receive a set of gamelan degung from Sunda. Today, Emory is among a handful of universities in the United States capable of performing both Sudanese and Central Javanese gamelan traditions and is one of the only gamelan ensembles in the Southeast. 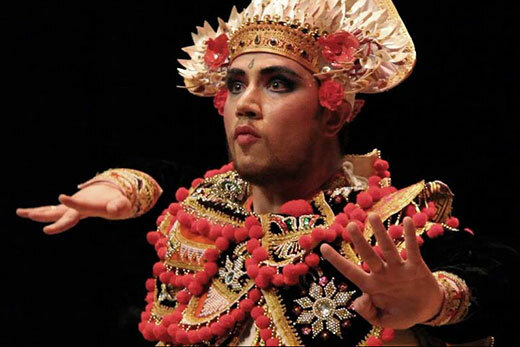 Staying with the family of his gamelan guru, he immersed himself in practice and performance, once again stepping outside of his comfort zone to play a key role as the warrior Baris in a traditional dance performance. This fall, Sutherland heads to Spain as a Fulbright scholar, where he will be teaching English to high school students. An “unofficial Spanish minor,” Sutherland spent the past academic year serving as a resident adviser for Emory’s Spanish House. In the future, he is considering pursuing an MD/PhD in population health — an opportunity to connect both the humanities and the sciences. He’s also intrigued by the field of medical ethnomusicology, using music as medicine. But even as he looks toward the future, it’s hard not to reflect back upon what Sutherland found here at Emory. “In Bali, I remember sitting in on music rehearsals where not a word of English was spoken for two hours. Multicultural experiences have defined my college career. And by immersing myself in other cultures, I’ve learned so much about myself. Editor’s note: For a first-hand account of Ryan Sutherland’s research experience in Bali and a video of his dance performance, visit his Rose Library scholar blog.